2016 was a rough one, on a lot of levels. A lot of what has happened, especially in the last few months, has tested my belief in the basic goodness of people. A lot of what has happened this year has made me ask questions I’d never thought I’d have to ask about myself and the people around me. 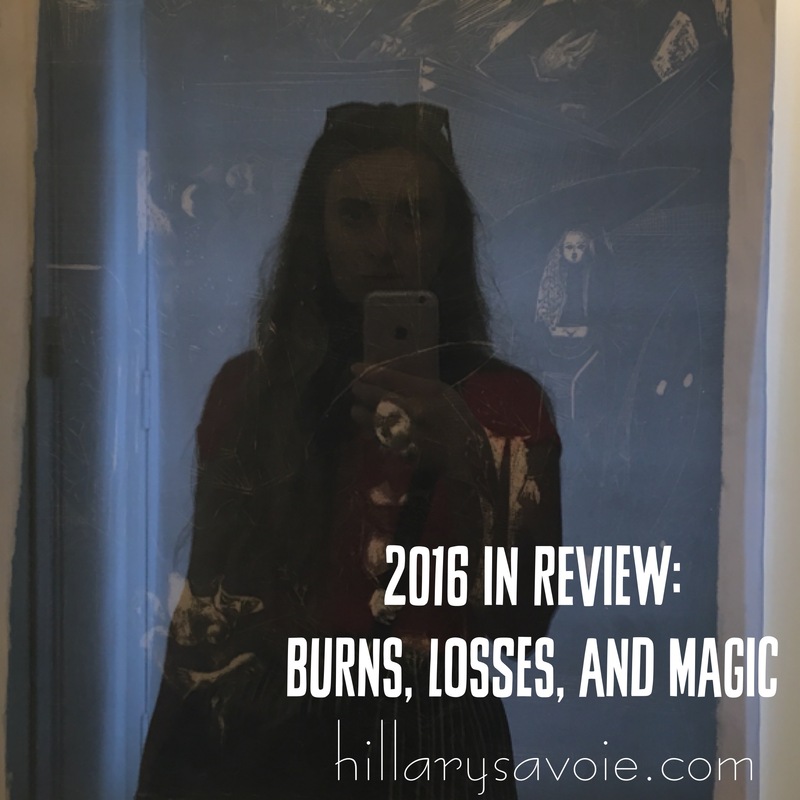 It feels like 2016 has been an important year of (often painful) lessons. This year has been about finding joy where it can be found. I know that my almost six years with Ez have all been lessons in finding parenting joy in unexpected places…and this year has been no exception as she has brought all manner of beautiful surprises to us—like proving that she is able to read full sentences and answer questions about them. But this year was also about me finding a sense of self beyond my somewhat all-encompassing role as Esmé’s mother: savoring it in the sip of a perfect cocktail, in the nerves of riding an all-together too big wheel way too high in the sky, in hitting a punching bag, in traveling to Paris in order to eat and drink everything in sight. And a lot of what has happened in the last year has shown me comfort and grounding in places and with people I was surprised to find waiting for me. The year began with the loss of my first childhood friend, Becky. Which lead to a reconnection with parts of an important community from my past. It is always such a devastating lesson to understand human connections in the face of loss…but it is also a beautiful lesson. And, in this case, one that has found me sitting with Becky’s mother, Claire, one of my childhood surrogate parents, more times in a year than we had in the past twenty years. And what a blessing this has been, what a reminder of who I am, at the core, and who helped me become that person. 2016 drew to an end with another life beginning in front of my eyes: the life of my newest nephew, Ahmad Alexander. Life works in these cycles of loss and birth. Rebirth and loss. Especially much this year. This year ended with the completion of another cycle that brought me back to the same place I was in December 2015: at the SCN8A gathering with my partner Juliann, learning things about our work, our friendship, and our selves. There were so many things about this year’s gathering that were the same as 2015, the people, the excitement, the emotion—but the person I was had been changed by the past year…I felt more certain, more present. I realized more than ever that what is so special about what Juliann and I do, together, is that we do it together. There is a kind of magic there. Speaking of magic, this year I found new voices in me as, with the steady guidance of my dear friend and constant editor Channing Rodman, I wrote about topics that scared me, startled me, changed me. These words she and I exchanged lit fires in places in me I hadn’t understood—the anger, the fear, and the power of those things. All sorts of things came from what I learned in the fire of 2016. In fact, in many ways this year has been about burning of the figurative and literal variety. I mean, literally, I burned my foot and leg badly enough to need a morphine-eased ambulance ride to the Emergency Department at the end of November. And as I sat half naked and burned on the floor of Esmé’s bathroom, watching the skin peel back from my ankle, listening to Esmé playing with her iPad, and trying not to pass out while I waited for my parents to arrive so I could call 911, I learned some things about how much fire I can handle. The burns have left scars that won’t likely disappear, but that is the price of life…and also of boiling water for ramen (I know, I know). And, fortunately, I think scars, like all the best broken and surprising parts of us, are beautiful, because they speak of imperfection, vulnerability, and strength. I had to miss weeks and weeks of boxing while I recovered from these burns. I watched my body grow a bit rounder again in places that had been hard. And I thought, Ok. This is ok. And then, once I was ready, I went back to punching the mitts. I went back to remembering the poetry of the way two people can communicate without words, with the sound and rhythm of gloved fist and hand connecting with a satisfying thwack. I went back to relaxing into my mind slipping away from thinking, and instead, just doing what is being done. It is now 2017. And, as I have done in mid-January of the last six years, tomorrow I will celebrate the birth of my daughter. This is a day that I struggle with each year. A day that my greatest joy and my greatest pain arrived all in the same tiny struggling little body. It is a day that everything changed. A day that made me feel as broken and scared and vulnerable and imperfect. The day I started to realize that my daughter, my motherhood, would be different than anything I’d ever imagined. It is a cycle—life itself, each new year, each new connection, and the times between writing and not, boxing and not. Also the discoveries we make in the spaces between births and losses, the connections, the kindnesses, the pains, the magic. It is all there. And even in the darkest of it, it is beautiful. just a brief notice… Hope you get this message, as I did not manage to find an email adress to send it to. I live in /Germany and the mum of two kids (12 and 7), the smaller one is also a member in the SCN8A ‘community’. My lovely daughter Ella’s seizures started when she was only three weeks old, followed by ongoing hospitalization, seizures, changing mediactions etc. without any progress so far. Last year I came across the research on the Uni Arizona and the websites related to SCN8A. I also knew about the meeting which took place in Arizona last Dec. but unfortunately I haven’t been able to attend as it would not be possible to take Ella on an overseas flight. Anyway, the reason I am writing to you today is that I am about to develop an idea for a ‘pro bono’ project, the earnings of which shall support research on SCN8A. If I understood it correctly, the cute foundation is also trying to raise money for the Uni Arizona is that correct? I would like to create a specific item and sell it and each earning shall be transferred to the U.S.. Currently I am about to create a ‘logo’ and I am wondering, whether the ‘SCN8A heart’ of the Webpage is a registered TM or if it could possibly used for my idea as well? My second question is, if ‘the cute syndrome foundation’ cooperates in whatever way with the other projects e.g. , wishes for Elliot’, ‘adeline’ etc. I am just asking because I don’t have a clue how to get things started. I would really appreciate a short message whenever possible and maybe/hopefully we can make a difference for our kids somewhen in the not too far away future! Hello Iris, Thank you for reaching out! The Cute Syndrome Foundation has worked on fundraising for some of Michael Hammer’s work at the University of Arizona, yes. We have also funded SCN8A work at the University of Michigan. And we will be offering another competitive grant in 2017. We also organized and ran the two family meetings in December 2016 and 2015 in Houston and Philadelphia (I think that is the meeting you are referring to 🙂 ) We can certainly speak more about what you have in mind. You can email me at hillary [at] thecutesyndrome [dot] com and my partner Juliann at scn8aepilepsy [at] gmail [dot] com. Also, I don’t think you are a member of our family support group, Juliann and I can help get you set up!